Three adjustable 18" wide shelves on one side; 18" wide wardrobe with rod on the other. Assembly required for interior divider, locking bar and handles. 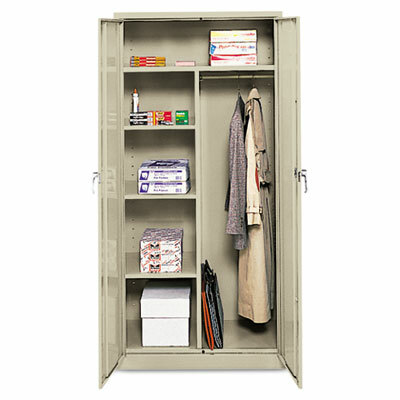 Assembled 72" high combination wardrobe/storage cabinet with three-point locking bar system locks top, bottom and doors. Full-width fixed top shelf and three adjustable 18" wide shelves on one side and 18" wide wardrobe with rod on the other. Doors open 180° for easy access to contents. Cabinet made of industrial grade steel with powder coat finish and satin chrome double handles.